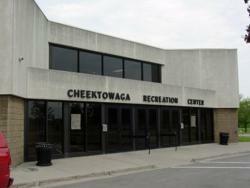 The Cheektowaga Warriors call the Cheektowaga Recreation Center their home. Located in beautiful Cheektowaga Town Park, the Recreation Center is easily accessible from the New York State Thruway. From I-90: I-90 to the Walden Ave. West Exit 52W. Proceed west on Walden Ave. approx. 0.75 mile to Harlem Rd. (Rt-240). Turn right and proceed north on Harlem Rd. approx. 0.5 mile to Greenleaf Avenue. Turn left on Greenleaf Lane and proceed approx. 0.25 mile to where it ends. Turn right on Ridge Park Ave. to enter park and proceed to arena on the left. From Fort Erie: QEW to Peace Bridge crossing. Cross the bridge, proceed approx. 0.4 mile and turn left on Porter Avenue. Proceed approx. 0.3 mile and continue straight on York St. (Porter Ave. forks to the right, but continue straight for York). Turn right on Summer St. and proceed approx. 0.8 mile to Best St. (road jogs right and becomes Best). Proceed on Best St. approx. 1.6 miles to Walden Ave. (Best turns into Walden). Continue on Walden approx. 2.6 miles to Harlem Rd. (Rt-240). Turn left on Harlem Rd. and proceed approx. 0.25 mile to Greenleaf Lane. Turn left on Greenleaf Lane and proceed approx. 0.25 mile to where it ends. Turn right on Ridge Park Ave. to enter park and proceed to arena on the left. ©2019 Cheektowaga Warriors Youth Hockey Association / SportsEngine. All Rights Reserved.